I loved this project! We incorporated elements from my newlywed clients' travels, as well as from their honeymoon to create this colourful souvenir of their life together so far. We went for a more realistic style inspired by wildlife illustrations on a gentle pink to keep the room interesting and warm throughout the year. A cheeky monkey and a macaw in the mirror's reflection are subtle hints at the client's sense of humour and one advantage of a hand painted design. What larks, what larks! I love what I do, and where my job takes me! This antique gypsy caravan was already beautiful, but time had taken its toll, and this once red caravan needed a new lease on life. 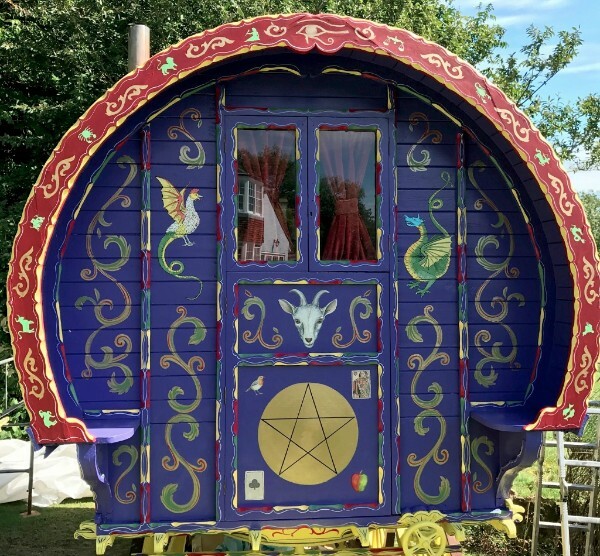 I worked closely with the client (who is both mystical and has a wicked sense of humour) to turn the caravan into a rambling abode fit for a cheeky traveling fortune teller. There was extensive collaboration between myself and the client before finalising the design, which was a total joy for me- that's what bespoke is all about! Woven throughout are images of true magical symbolism, as well as some cheeky bits; right up my alley! This was certainly the most interesting surface I've painted on to date, and one of the most fun (and detailed) designs to create! Not every project I do takes weeks to create. This was a very exciting and technically challenging project for me. What started as a beautiful, but plain pine coloured over-mantle, is now about to be the piece de resistance for a very chic antique mirrored wardrobe. 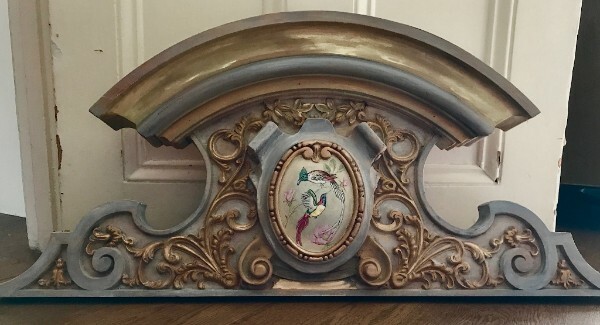 The cartouche in the centre has echoes of the chinoiserie murals I've created elsewhere in the client's home. I learned a lot whilst working on this project, and felt like an antiques forger creating it! I love adding details to a space that needs just a small touch of magic, and suiting different spaces and budgets.